The juxtaposition of two slabs of shaped emery-leather, which contain the bearing steel frame and form a single whole that merges the backrest with the legs, is the distinguishing feature of the Lamina chair designed by Mauro Lipparini. The structural stability of the entire shaped panel is ensured by the horizontal seat surface that secures and stabilizes the two side edges of the chair. 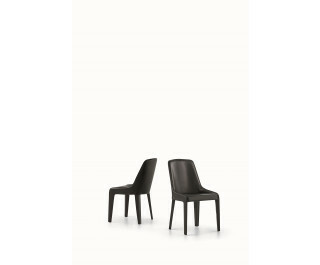 Lamina is also available in a version with armrests (Miss Lamina), or stool version (Lamina too), like a wader standing on his four legs, characterized by the cosy hug of the backrest which embraces the soft frame. Both the chair and the stool are upholstered in emery-leather.